Artist rendering of the Thirty Meter Telescope (TMT). Photo courtesy of TMT. 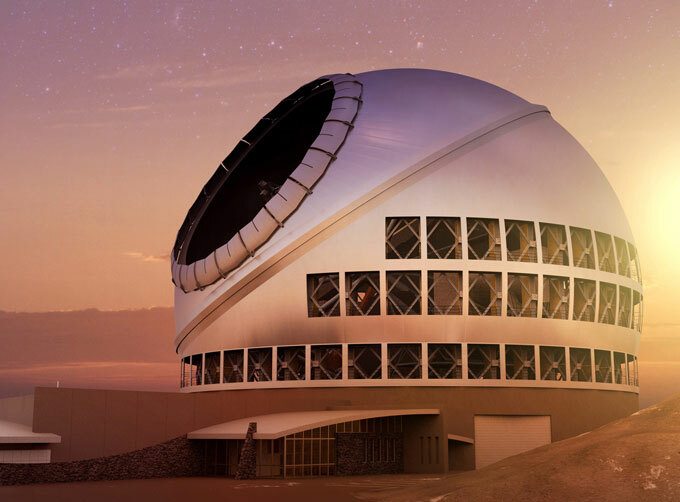 UC has been a world leader in astronomy and astrophysics research for more than 127 years, and the Thirty Meter Telescope (TMT) will build on that history. The University of California is on a mission to revolutionize humankind’s understanding of the cosmos, by building the world’s most powerful telescope. Once complete, the TMT will be the largest and most powerful land-based optical/infrared telescope on Earth. The project — which has been spearheaded by UC and the California Institute of Technology since 2003 — will be built and run by a consortium of universities and scientific organizations from Canada, China, India and Japan. The TMT will stand atop the Mauna Kea volcano on the island of Hawaii, near the W.M. Keck Observatory that UC has operated with Caltech since 1993. Groundbreaking on the project occured last October, with the telescope expected to become fully operational by 2024. TMT scientists and engineers, including those affiliated with UC, have been working for years on the design of the telescope. Its primary mirror will be comprised of 492 individually segmented mirrors that will work together as a single reflective surface 30 meters across — a size slightly larger than a basketball court. Special adaptive optics will correct for the blurring of Earth’s atmosphere, enabling the TMT to study the universe as clearly as if the telescope were in space. The technologies for building segmented-mirror telescopes and for adaptive optics corrections were pioneered by UC scientists and have been realized in the extremely successful Keck Observatory telescopes. Once complete, it is expected to produce images that are three times sharper than images from the existing Keck telescopes on Mauna Kea and 12 times sharper than even the Hubble Space Telescope. Text courtesy of Harry Mok, UC Newsroom and TMT.